Destined to become a Commander-in-Chief of the Sons of Veterans, an Indiana Attorney General and a distinguished community leader, Charles Freemont Griffin was born in 1857 to John Elihu and Milissa [Melissa ?] Ann (Scott) Griffin in Henry County, Indiana. His father was born in Spiceland in 1830, his mother in Wayne County in 1831. He derived his membership in Sons of Veterans through his father’s service as a Major and Paymaster during the Civil War. Brought up in Crown Point, Indiana, Griffin studied law under his father who had a law practice in town. He completed a short course at the Spiceland Academy, a higher education institution run by the Quakers, continued to read the law in his father’s office, and was admitted to the bar in 1877. In this period, he served for ten years as Superintendent of The Presbyterian School of Crown Point. Following the political path taken by his father, a state senator from Lake County, Charles was elected Secretary of State in 1886. He was then 29 years old, the youngest man ever to hold that elected position in Indiana. “No other boy has yet reached so high a position in civil or political life,” the Encyclopedia of Genealogy and Biography of Lake County observed in 1904. He continued in office through January 1891, working with two governors who had Civil War backgrounds: Isaac Pusey Gray, who commanded the 4th Indiana Cavalry, and Alvin Peterson Hovey who was Brevited Major General. The 8th National Encampment of the Sons of Veterans of the U.S.A., held in Patterson, New Jersey, elected Griffin Commander-in-Chief. During his tenure, he is reputed to have visited every state and territory in the interests of the Order. In the 1890s, Griffin moved to Hammond, where he opened a law practice with offices in Hammond and Chicago, along with Judge Walter Olds, retired Chief Justice of the Indiana Supreme Court. He also helped form the Hammond, Whiting, and East Chicago Electric Railway, known as the “The Green Line,” and became its president. Amongst other civic endeavors, he introduced a new water plant plan for the city of Hammond. Much like his father, who in 1864 was a delegate to the National Convention that nominated Lincoln for his second term, Griffin became a Delegate in 1892 to the Republican National Convention at Minneapolis, which re-nominated President Benjamin Harrison. In addition, he had charge of Harrison’s Headquarters at the Grand Pacific Hotel in Chicago. Mentioned as a possible candidate for Governor of Indiana after the convention, Griffin declined in favor of Ira Joy Chase, a Past Indiana Department Commander of the Grand Army of the Republic, who was elected. An inveterate joiner, Griffin became a member of Son of Veterans, General Charles F. Griffin, Camp No. 39 in Hammond, the Knights of Pythias Lodge No. 56, a 32nd degree Mason, a member of the Sons of the American Revolution, and a charter member of the Columbus Club of Indianapolis. From 1884 to 1892 he served in the state militia as captain of a company at Crown Point and later as lieutenant colonel of the Third Indiana National Guard Regiment (Indiana Legion), in service as the 157th Indiana Volunteer Infantry — the “Elkhart Light Artillery” — during the Spanish American War. 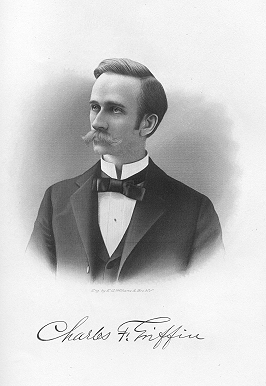 Brother Griffin died in Hammond, unexpectedly on December 21, 1902. He left behind his wife of twenty-two years, Edith Burhans Griffin, a son Karl Scott and daughter Ida Burhans Griffin. Also left behind were his bothers Horace, the eldest, and Cassius, the youngest. He was interred in Row 12 of the East Section of Maplewood Cemetery. This was once Crown Point City Cemetery and is now the Maplewood Historical Cemetery, Crown Point, Indiana. It is of interest that Griffin had a friend, Kenesaw Mountain Landis, whose very name is a reminder of the Civil War. Landis supported Griffin’s election as the Indiana attorney general, and he was rewarded with a major position in the department. He left after two years to read law and, under a constitutional provision that did not require an examination, obtained for himself a certificate of admission to the Indiana bar. He later became a federal judge and gained considerable fame as the first Commissioner of Baseball.